So you’re swiping right and swiping left, swiping left and swiping right, swiping right and swiping left… Tinder is a practically mindless activity, at least anytime I’ve ever seen someone use it. But what are you swiping right and left, yes and no, to? Sometimes, it’s people’s lives. 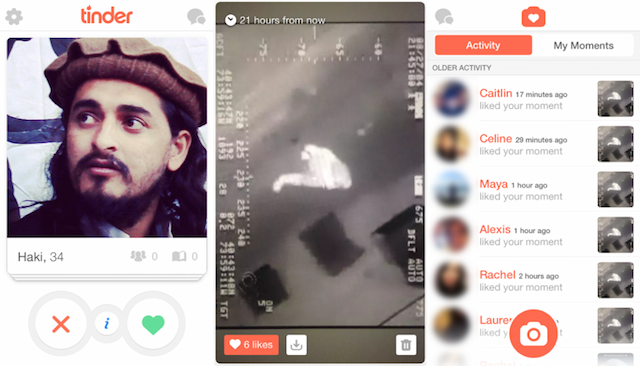 This isn’t actually a new project, but last summer artist and hacker Matthew Rothenberg was inserting imagery of drone strikes and drone strike victims into Tinder for an artwork he calls Swipe Left. That bearded young man gazing off into the distance wasn’t another Williamsburg hipster. It was Hakimullah Mehsud, a commander in the Pakistani Taliban. Mehsud was killed by a US drone strike in 2013. Which way did you swipe? And what about that odd black and white photo that you liked on “Haki’s” profile? Blurry abstract art? No. Footage from a drone about to unleash hell on a target. Since Rothenberg has already written so well about the social and political meaning of Swipe Left, I just want to make a note about its meaning within the art world. Rothenberg considers the piece to be performance art, and yes it is, but what I think is most fascinating about Swipe Left is its relationship with street art. 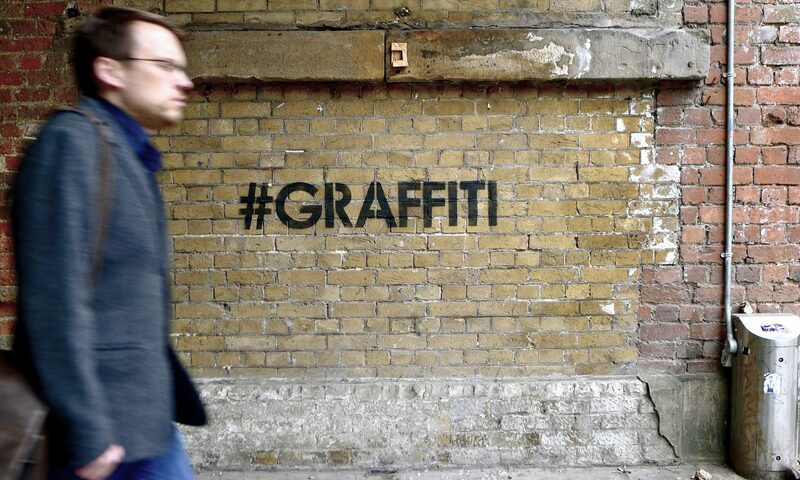 It’s a great example of what I’ve called invasive viral art, art that treats digital public space like street art and graffiti treat physical public space. While Tinder users are expecting one thing, Rothenberg gave them another, and he used the app for something it isn’t intended for. Swipe Left may not immediately appear as art to viewers, but that’s okay. Plenty of street art doesn’t either: John Fekner’s random dates series, Dan Witz’ Broadway Poem, Jenny Holzer‘s Inflammatory Essays when they first appeared on the street as posters, and of course Shepard Fairey‘s early work could all appear as something other than art to someone seeing it for the first time, but it could still reach them. And as Rothenberg points out, “Tinder members who encounter the images are forced to make a decision.” Unlike street art, which can be ignored, Rothenberg’s project can be swiped away or not understood by the view, but it can’t be ignored entirely, and any reaction to Swipe Left‘s content is a valid and interesting data point. But even if Swipe Left is a bit hidden within Tinder, arguably really meant to be be considered by observers reading about the work later on, not the Tinder users participating in the performance/experiment, the piece shows the potential for a new venue for performance art and invasive viral art. What if someone like Shepard Fairey joined Tinder and used it to put his art in front of a new and unsuspecting audience? Every day, he could upload a different poster as a profile picture. Suddenly, his work would be reaching people in a relatively random way, like a sticker or a poster on the street does. And if people are playing with their phones and browsing Tinder as they ride the bus to work rather than looking out the window where they might see some street art, why not place that art on Tinder instead of, or in addition to, the street? Reach people where their eyeballs already are. I’d swipe right to that.